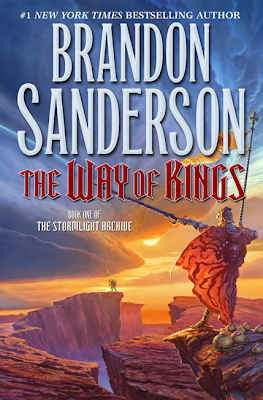 The Way of Kings... hype picked up fast for this novel, generated by Tor marketing plans and by my own eagerness in reading about the Stormlight Archive project. I haven't been exited for a new series like this for a while. Maybe the fact that I like to get my hands on door-stoppers had an influence in this. Anyway, that much hype can taint the view of a book even before the turning of the first page but in this case, it didn't influence me, the reading did and it left an enjoyable feeling. Kaladin Stormblessed is a brilliant young squad leader. He's fighting in skirmishes in his home country trying to prove himself and his squad mates in the eyes of his light eyed superior, to be sent where the real fighting is, the Shattered Plains against the Parchendi. On those plains, Dalinar, the King's uncle and revered general known as the Blackthorn is trying to unite the highprinces for the safety of Alekhar and put an end to the Vengeance Pact. His son, Adolin, will keep him in check when the highstorms strike and he starts having visions of the past. On the other side of the ocean, Shallan, a young artist from a family on the edge of bankruptcy, will try to convince the illustrious scholar Jasnah to take her as a ward. However, there's more than a wardship in her sights. In trying to define The Way of Kings, I would conclude that it's an impressive Epic Fantasy novel in the representative kind of Epic Fantasy style. It's not groundbreaking as some books or series can be defining to a genre, norm breaking or creating a new sub genre in itself but since The Stormlight Archive series still has nine books to prove itself, it could be within this spectrum eventually. Don't get me wrong here, this is a splendid work and it will not blend within the horde of Epic Fantasy novels. The Way of Kings is massive in several aspects (needless to say that the book is just over 1000 pages). The prime element representing this magnitude is the world building, which is mesmerizing. It's as complex and original as any Fantasy world you can think of, a pretty crafty exercise and you can feel that there was a lot of thinking behind this world. In every aspect in which I can think to categorize world building in Epic Fantasy, The Way of Kings creates a high standard. A distinct fauna, original beasts, a religion anchored in the heart of tradition, a profound history, several distinct races with their beliefs (ex: the superiority of the light eyed cast), habits and way of life, well designed artefacts, etc... Everything is precisely linked together to create Roshar, a unique world. Brandon has already shown that he could create innovative settings but this time, it's perfected and wider in scope. One of the best examples of this is the concept around which the book is centered or the idea that probably shaped the vision, the highstorms. These storms are something way bigger than what we are used to, they fashioned the whole world. Imagine a huge hurricane coming several times per months at a furious speed and spawning almost the entire world. It left its mark on all the aspects of world building I spoke of earlier. Then, this world has to be populated by compelling characters. The story starts with a bang but without a hint that something big is coming. Eventually, the tale will attain a status of Epic proportions, recounted through the eyes of five or six PoV. Among these, Kaladin and Dalinar can really be considered as the most complete characters; ones I see myself following for ten books. I could not say the same thing about Shallan, though it may change in the future since she's not the most present protagonist in the novel. The story of Kaladin is told with flashbacks from his past, a nice thinking on Brandon's part. He recounts the events of his early years at key moments within the narrative, making us understand and believe the man's convictions genuinely. Brandon did not make him perfect and since he's a slave and having a hard time, some flaws ought to be visible. Anyone in this situation can have a downfall every so often. Kaladin and his surrounding cast of bridgemen felt at first a bit like the same old song. A group of rag-tag slaves training to be the best at what they do and eventually facing overwhelming odds. However, this is not really the case since the author gave them, or at least gave Kaladin, the means by which he can overcome these overwhelming odds. Concerning the rest of his bridgemen, they really are a colorful bunch of comrades. Regarding Dalinar and his son Adolin, they are the ones with the storyline driving the general plot forward. Both are wearers of shardplates and own a shard blade. This is one of the most interesting concept of the story. The shard blades can materialize within ten heartbeats and they can break through everything save the shardplates and similar blades. When swung at someone, if it goes through the spinal column, it simply extinguish his life. These weapons are incredible and could be too powerful, but Sanderson used them wisely, integrating them in the story to create balance. Battles fought with this kind of weapons are impressive, a choreography majestically fluid but easy enough to imagine given Sanderson's skill. Again, they are both characters with their flaws, making errors, but evolving from it and I grew fond of them easily. Two other secondary protagonists also stand out from the crowd. Wit, the King's Wit is quite something, in the mystical kind of way. And then, there's the spren. Kaladin is bonded by one and although it may be one of the few to show intelligence, she's only one pebble in the pond. They represent visible reactions to almost everything from glory to fire. It will be easier to understand when you read about them but here's another great idea, nicely developed. As I kept reading, I could feel that Brandon had gained more experience since Elantris. Writing a tale this long with so much continuity for so few PoV could eventually drag things down a bit (and it does in some chapters), however, he continually comes back with something refreshing or unexpected. The battles are well described but there may be slightly too much descriptions or reflection from some characters. Every part of the book (there's 4 of them) is separated with stories of people from around the world. Interesting but not really a necessity aside from one protagonist coming up every time, Szeth, a mysterious assassin growing increasingly intriguing. Then we get to the magic system or systems. Yes there is more than one way of using magic or benefiting from it (Shards, fabrials, lashings, etc...) and most of it make use of the energy coming from the highstorms (as does the money). Each of those "ways" is represented throughout the novel but they still shrouded in mystery. The master of magic system creativeness strikes again. Moreover, at the end, we can guess that Brandon has way more ideas in store than this. Finally, at the conclusion of the book, many story threads, ideas and theories connected. They created an expectation for things to come almost too great to wait on. A sound way to finish since there was no big culmination but many small denouement making up for it. Retrospectively, I think that Brandon decided to go through with The Way of Kings at the right time, after getting more experience as a writer. This is the start of something exciting. Technically, the book also contains drawings of the wildlife and ecosystem every so often. It implies that it is taken from Shallan's drawings. In addition to the numerous maps included, I can only praise the visual support. The Michael Whelan cover art is nice but I think there's too much color (there was a sketch in grey tones that I like more). The novel stands at 1001 pages. Oh wow! So much in one little book. ;) Okay, so it's not little but it is just the beginning to such a wonderful sounding series! It sounds EPIC in a big way. Brandon, by the sounds of it, touches on all the amazing things that make a wonderous book here in this one. I am looking forward to it. Thanks for the review! Thanks! :) Hope you get to read it soon. Finished reading this book, unbelievable how over hyped this thing is, the story comes to a grinding halt after page 47 and doesn't pickup until 543 pages late. What a tedious read and the ending is definitely not worth the time investment. First of all, I do agree that the Way of Kings is an amazing work of fiction. It is so due to its truly epic scope and unparalleled creativity; particularly the world building, races, classes, magic systems, etc. A very short list of fantasy works can even compare in these regards and I expect to be further blown away by these aspects in the sequels. I do agree that, after the first few pages, the pace really dragged until the second half of the book. However, some of this must be excused as much of these chapters were used to introduce the reader to the intricate world in which the story was set. While the overall plot was top notch, I think character development was a little weak at times (this is where Sanderson could learn a thing or two from someone like G.R.R. Martin). For example, I found Kaladin's manic-depressive fluctuation between ultra-positive leader and almost suicidal depression to be a bit unconvincing the way it was conveyed. What I found really exacerbated this was the way Sanderson had the characters sharing the same thoughts/point of views from one sequence to the next, which became somewhat repetitive. (Perhaps he picked this up from his extensive exposure to the Wheel of Time series - in which the expression of the characters personality and point of views have often suffered from similar heavy-handedness.) This repetition, to me, made it seem like Sanderson was trying to dumb down the book so he could be sure the reader would get what the characters were going through. I think a bit more subtlety in this area would go a long way. I will say that it was much improved over the character development of Sanderson's Mistborn series - which was OK in the first book, but then quickly went downhill in the second and was not so great in the third. I think as Mr. Sanderson continues to gain experience as a writer, this area will continue to improve in kind. and I bet readers will be pleasantly surprised by improvements in this area as the series progresses. Other than those critiques, I thoroughly enjoyed Way of Kings and, to re-iterate, am truly awestruck by the sheer scope that Sanderson is undertaking with this series. I will be eagerly awaiting future installments in the Stormlight Archive. I agree with the points of this review but am left wondering how one can read so much andyyet be left with such a lacking skill in grammar, syntax, and diction.